Outdated wall coverings such as wall paper and borders are one of the first things to change during a home and bath remodeling job. With the use of a heating gun, the glue used to secure wallpaper on a wall can be easily removed. The homeowner might choose to paint the walls instead of repapering the wall, and if there is any type of mar in the wall surface, spackling will need to be done to give the wall a smooth surface. There are a lot of choices to make when choosing the color of the paint in a home and bath remodeling job. If the home will be occupied by the present owner for more than 7 years, then any wall color suitable to their individual taste is fine. In order to be kindly favored by prospective buyers when the house is placed for sale on the real estate market, a neutral shade will be required. A fresh coat of paint is recommended prior to placing it on the market. Old walls tend to get dingy with age, and suffer from grease and grime build up over the years. Prospective buyers are more reluctant to buy a home that requires a lot of work, and many simply do not enjoy the idea of painting a house. Instead of scrubbing walls spotless, homeowners will simply paint over the old paint to cover up the grime and grease. To find home and bath remodeling plans, people may consult a building supply house that sells building materials and fixtures. They can refer you to an architect or trade magazines that feature many ads for floor plans. When you are ready to buy a floor plan that everyone in the house agrees on, they can be obtained very easily by purchasing them online at the company website. A favorite home and bath remodeling project is replacing the carpets in the home. Carpeting is another eyesore in the home that old and new homeowners do not like at all. In many homes, carpet is placed on hardwood floors, with a layer of padding to protect the floor surface and give the floor a cushy surface when people walk on it. Ripping carpets out requires the removal of tacking boards along the baseboards throughout the home. All carpeting should be hauled to the curb after it is removed from the home. With careful shopping and selection, a homeowner will be able to replace the carpeting in the home with no trouble at all. There are carpet factory outlets in many cities across the United States, and these sites are where commercial and novice carpet buyers get their inventories. If you do not think you can do this job successfully, it is advisable to contact a professional carpet installer to do the job for you. 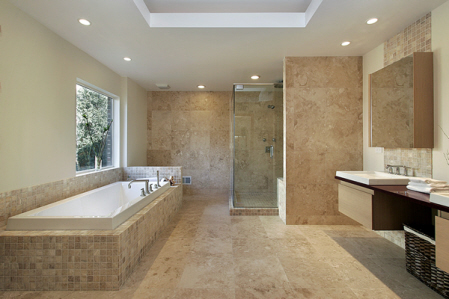 It may be necessary to update the tub or shower during a home and bath remodeling project. Outdated tubs are unsafe and people prefer to have a firm foot hold when they are standing in water. Other people have medical reasons that require that they sit while bathing. There are ample shower/bath combinations for sale at local home and bath remodeling warehouses.